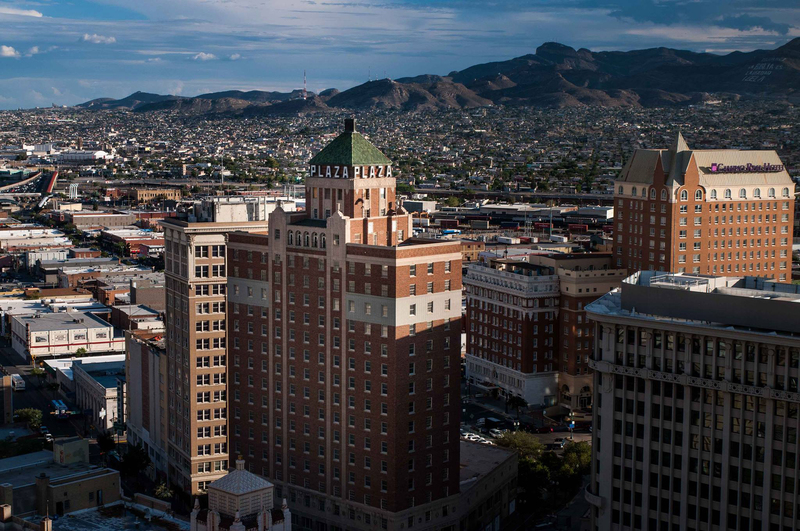 EL PASO, TEXAS – This is a more personal blog post than most, and longer than some. 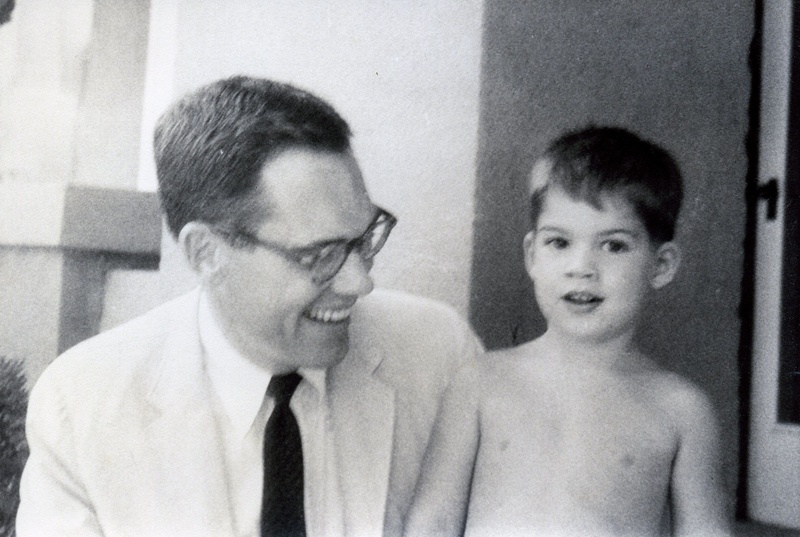 The story began a long time ago, though, and has roots winding back to my earliest years. Televisions were only black & white, signals were analog, radios were mostly AM and music was just becoming available with stereo sound on vinyl records. 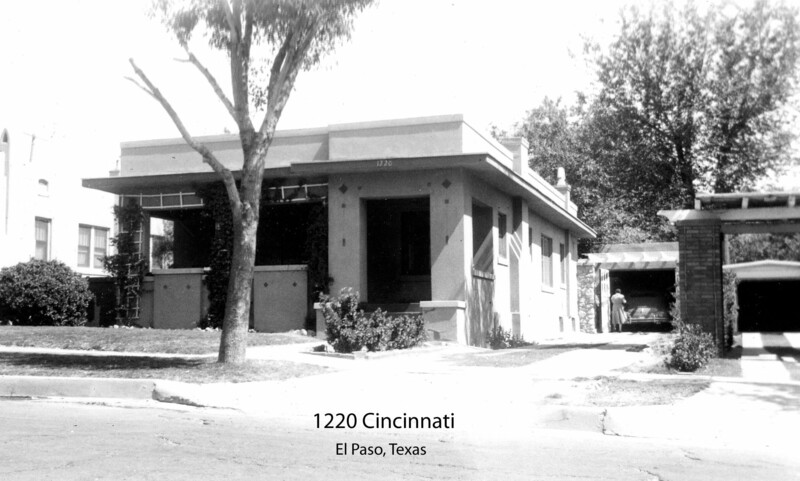 We lived on Cincinnati Avenue, fourth house on the right…up from Madeline Park… in Kern Place only a few miles north of the Mexican Border and the Rio Grande in Downtown El Paso. According to my mother, I learned Spanish from our live-in housekeeper before I learned English. I was a Border Gringo. To set a tone for these early formative years you have to understand the context of life for this eight year-old boy in El Paso. My father built the first real Bomb Shelter in the neighborhood, dug right into the middle of the driveway and accessed from a steel door cut in our basement wall. That addition to our home came thanks to Castro, Kennedy and Khrushchev who cooked up the Cuban Missle Crisis in October 1962. My father was a Korean War hero and knew well enough what the next great war might mean, even in this remote dusty high desert border town with a big military base. Heroes were a good thing to a young boy. Looking back, I thank God we never had to use that shelter for its intended purpose. My first sport passion was American professional football in the form of the Dallas Cowboys. My father introduced me to the Cowboys at an early age, probably soon after the team gained its franchise in 1960. I grew up on Tom Landry, Roger Staubach, Bob Lilly, Randy White, Michael Irvin, and Tony Dorsett. They became my sports heroes. Games on the television on Sunday afternoons after church were a ritual in their own right. 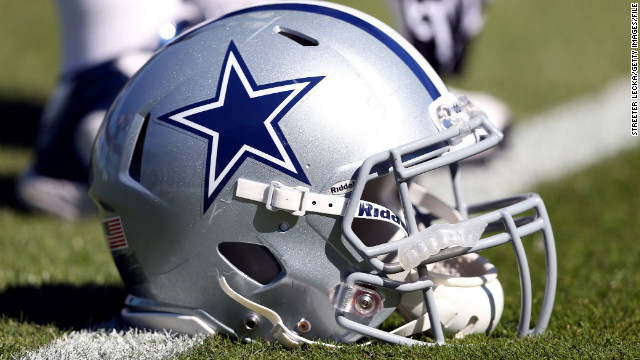 From 1970 through 1979, the Cowboys won 105 regular season games, more than any other NFL franchise during that span. In addition, they won two Super Bowls, at the end of the 1971 and 1977 regular seasons. These were my formative high school and college years and by now I was a true believer in “America’s Team”, as it was called. Of course, this story isn’t about the Dallas Cowboys or even American football. Read on. You see, after the rise of the Dallas Cowboy Football Empire there came a stretch of years…two or three decades long it seems…where that empire suffered a fall, a long fall. New ownership stepped in, new goals emerged, coaches came and went, and the sense of honor and passion that characterized the team of the sixties, seventies and early eighties had slipped away in the capital gold rush of the nineties. The turn of the millennium saw a mediocre team struggling to hold its head up among its peers, compared to decades prior. A move in 2009 to the largest domed stadium in the world in Arlington, Texas wasn’t even enough to kick-start this sputtering franchise. Even in El Paso (640 miles west of Dallas) the naysayers found their voices. As the years crept by, all of the excuses I had formulated began to wear thin in my heart. I needed heroes back in my life. From purely a consumer’s point of view, the football games themselves seemed to get longer and longer, as more official commercial time outs seemed to be encroaching on the field of play. You could hardly watch six or eight minutes of football without some whistle stopping the action and the networks inserting a commercial advertisement. One had to allocate three to four hours to take in a sixty-minute football game on television and, given Dallas’s performance, it wasn’t always the best use of that much time. The “Commercialization of the National Football League” was in full swing. Even the Super Bowl, as it has evolved, is as much about the teams vying for that Championship as it is about the half-time entertainment show and the television commercials surrounding the game itself. Big money had hit the big time. Beyond the team itself, the National Football League (NFL) was making my sports experience more uncomfortable: attempts to introduce American Football to Europe and Asia, frequent and almost experimental rule changes, internal investigations of all sorts, cheating scandals, drug use on and off the field, intentionally violent “play for pay” and even off-the-field criminal behavior. By 2012, medical research studies brought on by lawsuits rather than concern for the players were looking into long-term effects of sustained high-impact play on mental function and neurologic diseases. Tony Dorsett, my old hero, was a victim of such tragic brain damage and had become a TV spokesman for that cause. Things weren’t looking any better in the league, or in the sport of football as whole. It had become very painful to be a Dallas Cowboy football fan. However, again, this story isn’t about Dallas Cowboy Football, except in the way you must break an egg to make an omelet! I was asking: Was there something better? or even, What could I do about it? I realized that I needed to believe in a sports team again, with a passion like I remembered from childhood. I wanted to trust ownership, management and players to deliver an exciting, professional and honest game…whatever kind of game that might be. I wanted to enjoy a journey through the seasons of a great team growing, adapting and blooming. I needed those sports heroes from my childhood. The truth was that for years my passion for almost any sport had been drying up. I was aching inside, watching my team unravel in plain sight. I considered following another NFL football team, for regionally we had a choice of Denver, Arizona and Houston besides Dallas, but many of the same faults applied to the whole league. I considered other professional American team sports: baseball, basketball, even hockey. Other than finding a soft spot with our local University of Texas at El Paso (UTEP) Miners men’s basketball team, which I followed closely, I continued on as a nominal Dallas Cowboy fan–but, my heart was wandering and looking. 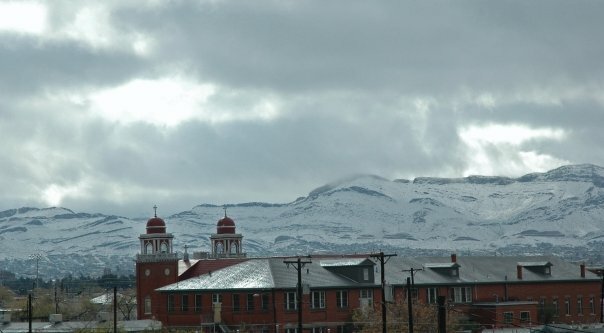 The Franklin Mountains, looking north from Downtown El Paso and the Mexican Border at the Rio Grande, where El Paso, Texas and Juarez, Mexico share a valley and a 400-year history. During the 1990’s while working at a large local commercial real estate firm, Best Real Estate, our managing broker would occasionally bring in his portable analog television with the “rabbit ears” and perch it on his credenza near the window of our 11th-floor offices on Main Street in Downtown El Paso. His office, like mine, faced north from the twelfth floor toward the dramatic Franklin Mountains overlooking the Paso Del Norte. El Paso’s three main network television broadcast towers perch along it’s 6,000-foot ridge line. In our sister city of Juarez, Mexican television stations broadcast from the tops of the Sierra Juarez mountains, south of us on the other side of the river. We had true international television access here at the Pass of the North! 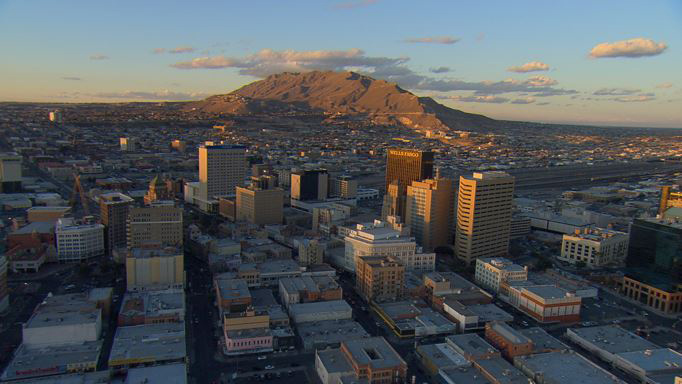 View of Downtown El Paso and Juarez Mountains to the south. Photo by Lewis Woodyard. I mention this because Jack Mooney loved to watch soccer on his old portable analog TV, and sometimes back then a particular game might only be broadcast on the Mexican television networks, in Spanish. Not to worry, most of us were conversant in the language. I remember how curious it was to see Jack fiddling with those antenna, seeking that best signal, trying to follow the match as he worked at his desk, volume almost turned to a whisper. Now and then a muffled shout or cheer would echo down the hallway to my office. Sometimes I would drop in to see what was going on and hang around, asking him to explain the game. It was through my friend Jack Mooney that I first glimpsed what a passion and love of soccer actually looked like. Jack would watch national team competitions such as World Cup matches or the lead-up qualifiers. He would watch professional club competitions. I can remember the sparkle in his eye when a soccer game was on. Jack learned to love the game while in the Army, stationed in Italy. After marrying and settling down in El Paso, he and Brook raised a family of soccer players. Jack even coached a successful local girls soccer team. His knowledge of the game flowed easily through our occasional sport conversations as we huddled around that little TV in his office. I remember during one game, he pointed out a distinct difference in the playing styles of the two teams: Italian “long ball” passing, versus German “dribble and control”. I’ve remembered that observation to this day. Point being, he subtly introduced concepts of game play and nuances of strategy beyond just the rules of the game. The tutelage under Mooney opened up a completely different way for me to see this sport. I should have known then how this story would turn out. This was the beginning of my journey into the world of true football, a Border Gringo’s visit to “King Kenny’s Court”…a place we will understand and explore in more detail later. Time passed, Melinda and I raised a family, sport drifted off the radar screen for me. South America taught me more about the world’s most popular game. 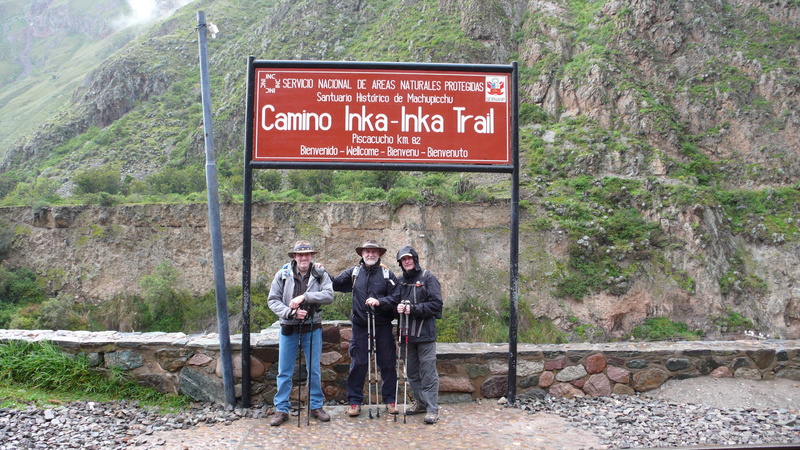 In February 2010 I had an incredible adventure with two old high school friends: Trekking the Inca Trail to Machu Picchu in Peru. Beginning our four-day hike at Kilometer 82 on the rail line to Aguas Calientes, we disembarked civilization and began a journey into the Andes Wilderness. Our first night’s camp was a town called Wayllabamba, at a trail junction before the steep ascent of Dead Woman’s Pass. There, in the evening twilight, I watched from the top of an ancient Incan wall as a pick-me-up soccer match unfolded between native porters in a remarkable high-altitude setting amid Inca ruins and monstrous peaks. I was mesmerized. It was obvious that there was a passion for the game which overcame that day’s tedious trek. What amazing shape these men were in! They had just spent all day carrying tens of kilos-worth of baggage up the trail, but had the heart and soul for a competitive game I was barely understanding. I have wondered about the significance of that moment, as I watched the setting sun catch the tops of the nearby peaks, deep in the Andes Mountains. Looking back now, its remarkable how the tug of soccer would have been felt in such a remote setting, but there it was. 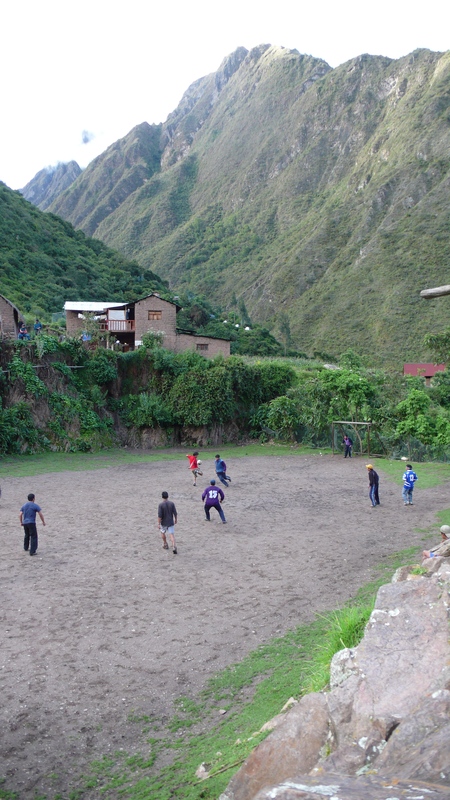 Soccer game at Wayllabamba, Peru…at over 10,000 feet above sea level…on the Inca Trail Trek in 2010. The Summer after returning from Peru, I was posing questions based on this checklist and seriously considering a wholesale shift in my allegiance as a sport fan. Coincidentally, the FIFA World Cup 2010 was about to take place in South Africa…and all over the television. The World Cup pits teams representing each qualified country in a tournament for World Glory every four years. Those teams are made up of professional soccer players who are citizens of each respective country. Their livelihood is generally derived from their professional club salary and commercial endorsement packages, but they set aside time to “volunteer” for duty to their national teams during each four-year World Cup qualification and playoff cycle. It was the first time I remember such broad coverage in the mainstream media in the United States. Up until this point in my journey, soccer was simply one of a number of choices in my inevitable sports allegiance shift. Circumstance and recent experience seemed to be proving that my field of choices had narrowed dramatically. Given what I had so far experienced in this search process, I had to consider whether this sport called “soccer”,played by most of the world’s population, might actually hold those special qualities that I sought. One thing was certain, this World Cup event in 2010 got a lot of broadcast attention, and made one point that rang true to me during the course of the television coverage: the game was about the “game”. Two forty-five minute halves, with a fifteen-minute break, and no time outs for commercials! A little less than two hours of focused, intensive sports action, virtually non-stop. For that, and several other reasons, I got hooked. So, this was it….it would be soccer! By the end of the World Cup 2010, I knew that my new sport would be soccer. The world calls it futbol or football, the “beautiful game”, even though the term soccer had been coined in England in the late 19th Century. Whatever it was called, it certainly met the test: a world-wide sport, international competitions, interesting travel opportunities, broad television coverage, and an historical context. I had never played soccer in school (it wasn’t offered in the El Paso school systems at the time). But, many years back, I was a fan of our college soccer team at the University of the South in Sewanee, Tennessee, where a famous American soccer player and classmate gleaned significant national attention in the early years of the NASL: his name was Kyle Rote, Jr. Back then, however, I was really just an observer to the sport. Now, as a dedicated nascent fan, I had to task myself to really learn the rules and nuances of the sport from the outside, as it were. I studied the history and rules of the sport, going back to its beginnings in the public schools of England with the Cambridge Rules in 1848 and the founding of the Football Association (FA) in 1863. I learned about the international professional club leagues and competitions, delved into the history and system of the international World Cup competition, and watched as much narrated television coverage as I could find. Which brings us back to the World Cup 2010. I immersed myself in World Cup coverage, following national teams filled with the professional club players whom I was learning about. In fact, the World Cup is a stage of immense proportions and significance every four years for those professional players. The “transfer windows” for player acquisitions by club teams seems to be the most active in the period just following the World Cup, in late summer. Team management and owners always have their eye on the shining stars of the World Cup, for good reason. Here was where the interests of the national teams under the World Cup structure of FIFA (International Federation of Association Football) and the interests of the professional club teams of the world crossed paths. With the sport decided, I now had to concentrate on the search for my team. The world was a big place, with lots of clubs from which to choose. It would be easy to decide on my favorite World Cup national team. When it came to that national team competition, I would always be a supporter of the United States Men’s National Team, an American Outlaw. Some of those USMT players actually played in Europe on several professional club teams, a majority were on teams within the North American MLS system. I could be consistent both as an American Outlaw and as a professional soccer club fan somewhere else. I could have looked at the North American model, Major League Soccer (MLS), to search out my future professional team. However, in 2010-2011 the MLS was just coming into its own and hadn’t achieved the acclaim that has come from most quarters of late. Back then, I didn’t have to look very hard to realize that the best teams in MLS (LA Galaxy, Portland Timbers, and others) just weren’t at the same level as the teams that came from the leagues that delivered the champions of Europe. The MLS league schedule and the player acquisition process are also different from other world soccer leagues. The opportunity for synergy between MLS and the other professional leagues in the world was limited. It would probably be a European team. Selecting my professional club team would prove to have more subtle nuances than I expected. There was a rich European history to some clubs – stretching back over a hundred years in some cases – which I had to understand. The whole system of club affiliation, organization and play was new to me. So, I dug into it. Each major country in Europe has several professional soccer leagues of various skill ranking. 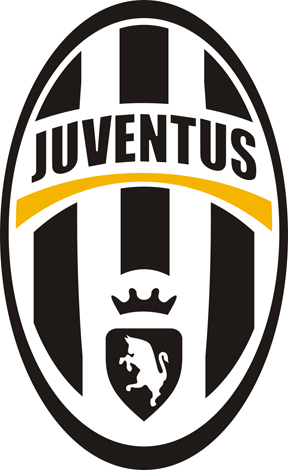 The top tier of club teams in Europe are found in the following professional leagues: La Liga (Spanish), Ligue 1 (French), Premier League (English), Bundesliga (German), and Serie A (Italian). Each league has twenty teams who play each other twice each season – home and away. The season runs from August/September to May, for a total of 38 league matches – called “ties” in the English vernacular. A win earns three points, a draw one point each team, and a loss nil to the loser. The League Champion is the team with the highest points earned in league play over that season. Those European professional soccer clubs are organized under an athletic association called the Union of European Football Associations (UEFA), the administrative body for association football in Europe and part of Asia. UEFA consists of 54 national association members, and runs national and club competitions in Europe including the UEFA European Championship, UEFA Champions League, UEFA Europa League, and UEFA Super Cup. It controls the prize money, regulations, and media rights to those competitions. So, beyond the success achievable by teams within their league, the Champions League and Europa League competitions organized by UEFA pit the finest club teams in Europe against each other through a playoff process to determine the best club team…much like an annual version of the World Cup for professional teams. For instance, the Champions League competition will include the top four teams from the English Premiere League, the German Bundesliga and the Spanish La Liga; the top three teams from the French Ligue 1, the Italian Serie A, and the Portuguese Primeira Liga; and the top two from Russia, Netherlands, Switzerland, Turkey, etc. The higher the UEFA coefficient for that country, the more teams allowed to play in the Champions League competition. Even the lowest ranked country-leagues send one team, their champion that year, to the UEFA Champions League competition. Tracking historical achievements within these championships, as well as within league competition, could give me an insight which clubs I might consider as my finalists. Winning traditions beget strong fan bases and great drama. UEFA is one of six continental confederations of world football’s governing body FIFA. North American, Caribbean and Central American soccer is organized under CONCACAF, as one of those six continental confederations, also. FIFA is the international governing body of association football. It is responsible for the organization of soccer’s major international tournaments, notably the World Cup, which began in 1930, and the Women’s World Cup, which began in 1991. FIFA was founded in 1904 to oversee international competition among the national associations of Belgium, Denmark, France, Germany, the Netherlands, Spain, Sweden and Switzerland. 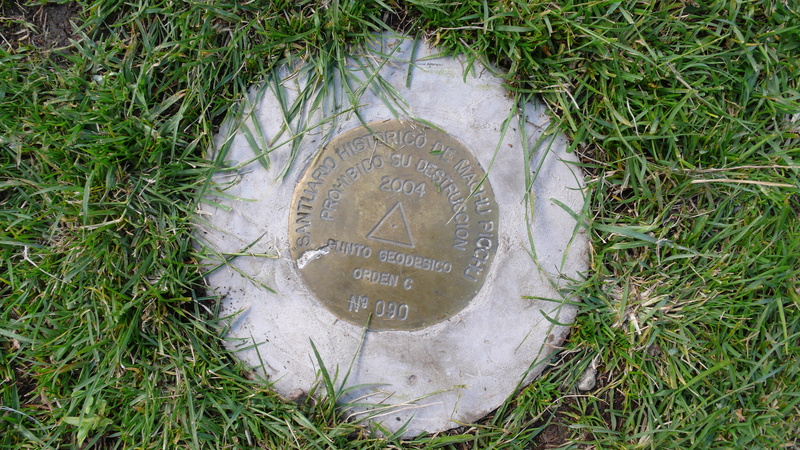 Headquartered in Zürich, membership now comprises 209 national associations. Member countries must each also be members of one of the six regional confederations into which the world is divided: Africa, Asia, Europe, North & Central America and the Caribbean, Oceania and South America. I pared down my set of choices significantly by eliminating Asia, South America and Africa – each presented challenges to me ranging from limited television coverage, to time zones and even cultural affinity. 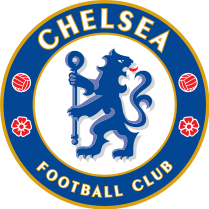 I decided my choice would be a professional club team from one of the European Leagues for the access to television and print media coverage, cultural affinity and for the high quality of the clubs and players themselves. It would be a European team, a club team in UEFA. How would I watch and enjoy these beautiful games? Access to televised games was very important, especially live broadcasts, and of course the quality of those video images and the commentary and network support that came along with them had to be considered. Fox Sports had just landed a deal to televise the English Premier League, sponsored by Barclays Bank. Those games were broadcast live on Saturday and Sunday mornings, seven-hours time difference between El Paso (MST) and England (GMT). Honestly, after a lifetime of afternoon and evening NFL games, it was difficult getting used to games sometimes beginning at 5:45 a.m.! Needless to say, this was a real paradigm shift for a fan used to a beer and pub environment for the big sports game. Fox Sports made the difference in my early decision-making process. 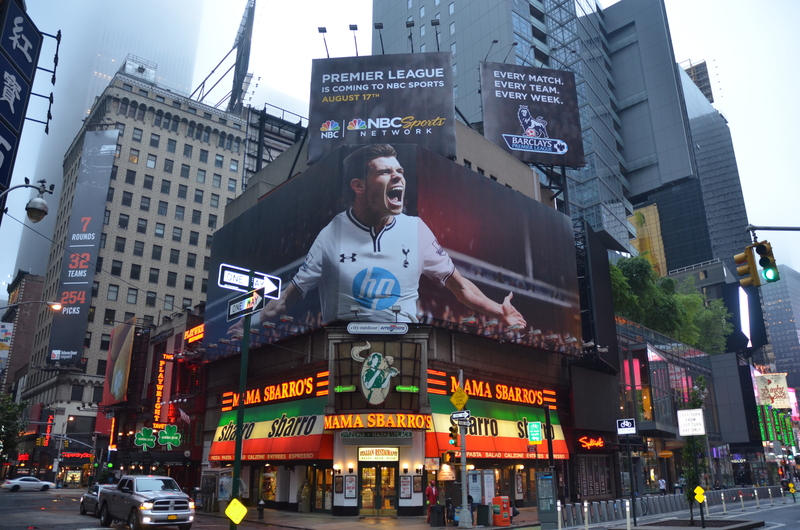 NBC Sports picked up the exclusive North American broadcast rights to the English (Barclays) Premier League in the Fall of 2013, announcing it with a huge promotional campaign. Viewership soared as live access to every Premiere League match was facilitated by the NBC network’s many digital broadcast/satellite channels. Likewise, MLS soccer in the United States and Canada had been televised on Fox Sports for several years, but in 2012 moved to NBC Sports where it doubled its domestic television viewership. 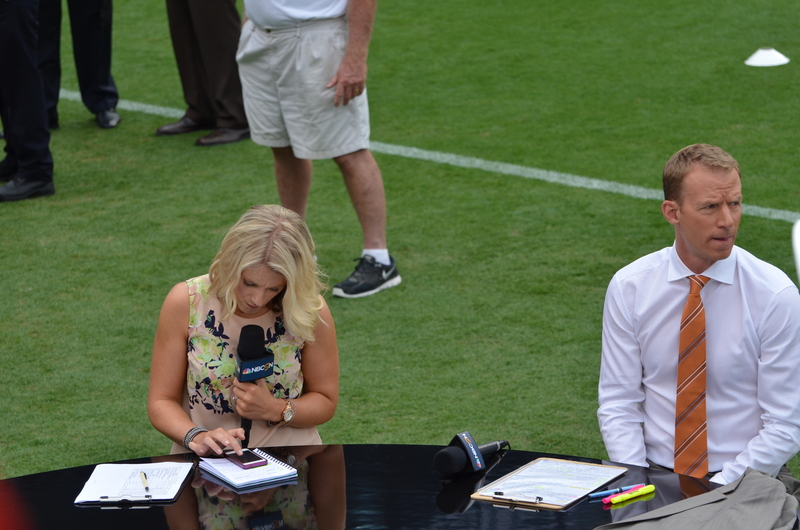 From 2012 to 2014, MLS matches were successfully televised by NBC Sports, with 40 matches per year—primarily on NBCSN, and select matches broadcast on the NBC network. Success can be a bitter reward in this game of sports television coverage. Another competitive MLS television deal snatched the prize out of NBC’s hands late in 2014. Beginning with the the 2015 season that starts in March, Major League Soccer matches will be broadcast nationally by ESPN networks and Fox Sports in English, and Univision networks in Spanish under an eight-year contract. Soccer was going mainstream. Broadening the landscape of televised soccer coverage in 2012, a new global network of sports channels jointly owned and operated by Qatari Sports Investments called beIN SPORTS came on the scene. 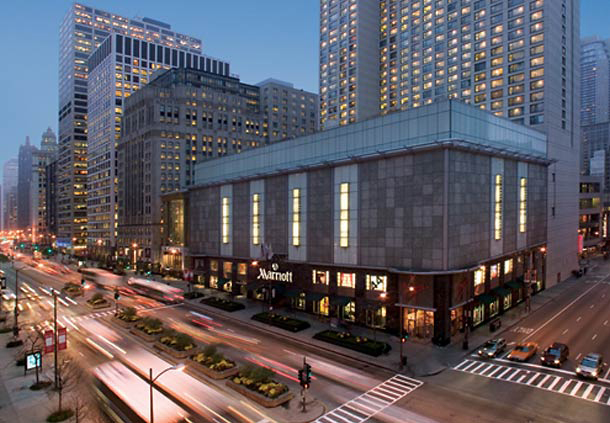 Its coverage is carried domestically by the major cable and satellite systems. In the United States and Canada, beIN SPORTS holds the rights to broadcast the English FA Cup and Capital One Cup tournaments, the La Liga, Serie A, and Ligue 1 league games, Copa del Rey, South American World Cup Qualifier and Football League Championship matches, in addition to Barca TV. However, I digress, back to the task at hand: picking a professional football club to follow. As much as it would have “felt” good to select a European team that was presently top of their game and winning every match they played, it struck me as a bit of a short-cut to the glory that I wanted to bask in once again. Certainly, selecting Real Madrid or Bayern Munich or Manchester United as my true team would bring an instant rush of success to the experience. However, I felt the glory would seem a bit hollow, having not experienced the cyclical process of rebuilding, changing and adapting that time brings to the life of a sports team. To use a metaphor: I resisted jumping into the race at the finish line of a marathon, having not suffered through the grind of running the whole 26-mile course! I had to look carefully at the both the present performance and the past history of these clubs that I was considering. Maybe a current champion wasn’t the best choice to learn the pulse of a club and experience the rise of a phoenix. I wanted to have a chance to get personally involved with this club that I would choose. I wanted the opportunity to travel to see play in their home league, or especially at their home field…called a “pitch” in the English vernacular. A chance to see this team on tour occasionally somewhere in North America would be a strong draw, as well. On a deeper level, if the team I found played in England, I would even have an ancestral reason for that affinity. Much of my family history played out in England, Wales and Scotland before my precursors came to America. 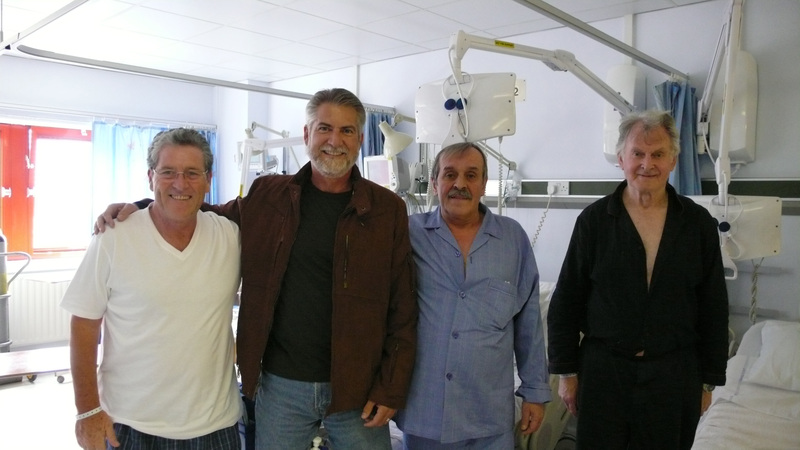 I had visited London twice recently and had a truly life-changing experience there in 2007 – when I suffered a heart attack and had emergency surgery at St. Mary’s Hospital on the Fourth of July. 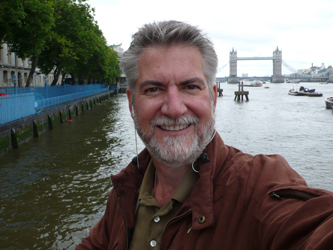 The memory of that adventure is seared into my psyche, and can be found in several posts in my “London 2007: Somewhere in Time” blog, at the link in the upper right-hand column. Certainly, England held an allure that other European counties couldn’t match. 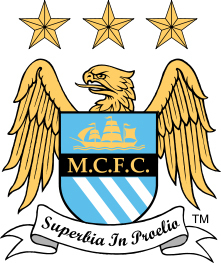 I would love to find the perfect team within the ranks of English professional soccer clubs. 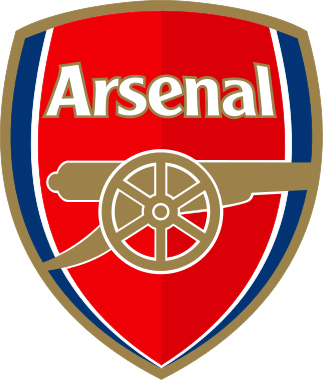 English soccer was organized in a very elegant system, run by the Football Association (the FA) for over one hundred thirty years. Some say the game got its start in England. That was a track record I could trust, check that box. At the top of English professional soccer competition, the Premier League (sometimes called the English Premiere League) is the most-watched football league in the world, broadcast in 212 territories to 643 million homes and a potential TV audience of 4.7 billion people. During the 2010-2011 season, its average game attendance was second only to the German Bundesliga with 35,363 per match, and stadium occupancy was a whopping 92%. The Premiere League has been sponsored by Barclays Bank since 2004 and is commonly referred to as the Barclays Premiere League. There were twenty teams to choose from in the English Premiere League. These teams represent a palette of history, regional British culture, sports tradition that painted a rich landscape for me to appreciate. Many of those clubs were now owned by non-English individuals or groups: Russian oil tycoons, Arab sheiks, Malaysian barons, American investors. Many of the teams in the Premiere League fielded more foreign national players than English players. The world was paying close attention to English soccer, but how would or could the ownership structure of a team or the passport array of the starting eleven impact the fan experience? In my own experience, an odd “tycoon-like” character had changed the face of ownership of my old Dallas Cowboys team. Why couldn’t another similar kind of buccaneer be as damaging on this particular English field of play? Another point of comparison: How did those twenty Premiere League teams respond year after year to the intense international pressure at this level of professional soccer? 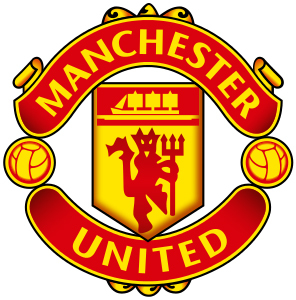 Since the League was founded in 1992, the undisputed leader of the pack in historical top division titles has been Manchester United (20), followed by Liverpool FC (18), Arsenal (13), Everton (9), Aston Villa (7), Sunderland (6), Chelsea (6), and recent newcomers, Manchester City (4) – the Premiere League Champions in 2013-2014. Of those leaders in top division titles, Liverpool, Tottenham, and Everton have never won the Premiership, as it is called. Here was fertile ground for me to grow my personal soccer experience, it seemed. I wanted to appreciate the complete process of learning about a team, following their progress and appreciating the rapture of a championship trophy earned the hard way. Therefore, it would almost be self-defeating to short-cut the process by jumping on an existing team’s successful “band wagon”. It seemed appropriate, in this respect, if I were to look at a top division team but not one of the recent Premiere League champions. If I pursued this track, I would be excluding the so-called “safe bets” of Manchester United, Arsenal, Manchester City or Chelsea, in favor of a Tottenham, Everton or Liverpool FC. Now, where would I turn for help with this final stage of my decision? 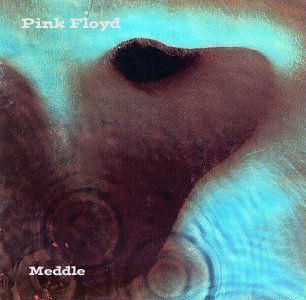 “Meddle” is the sixth studio album by English progressive rock group Pink Floyd, released 30 October 1971 by Harvest Records. Enter “Meddle”, the iconic sixth studio album by the British rock group Pink Floyd, an album I knew intimately almost my entire life. Critics would point out the significance of this album to the group and to the evolution of modern rock music. I probably bought this album my senior year at Coronado High School (1971-1972) or during my first year of college at the University of the South (Sewanee, Tennessee) in 1972-1973 and it has been a favorite of mine since then. I would listen to the classic instrumental “Echoes” on Side Two of the album for years thereafter, putting it on my record changer and drifting off to sleep in my room with that erie and haunting tune in the background. I even remember it playing in the common room of a youth hostel in Copenhagen that I visited on a Summer backpacking trip in 1973. But, many times I’d also listen to Side One of the album. It was there on Side One where several very interesting songs lived. One tune in particular carried a haunting intertwined sub-track which sounded like a chanting or singing crowd at a live sports venue in the background of the main song. That tune was called “Fearless”, and it is the third track on Side One. I must have played it hundreds and hundreds of times over the years. It is embedded in my psyche. Throughout “Fearless” one can hear a recording of fans in Liverpool’s Kop (the cheering section) singing a fan anthem called “You’ll Never Walk Alone” superimposed within the Pink Floyd music. That famous Rodgers and Hammerstein song became the official anthem of Liverpool FC sometime after Gerry & the Pacemakers had a number-one hit with their recording of it in the 1960’s. It is sung by the crowd before every home match at Anfield. However, I never knew the story of this anthem when I first appreciated the album “Meddle”. It was just one of my favorite college music albums, that was all. 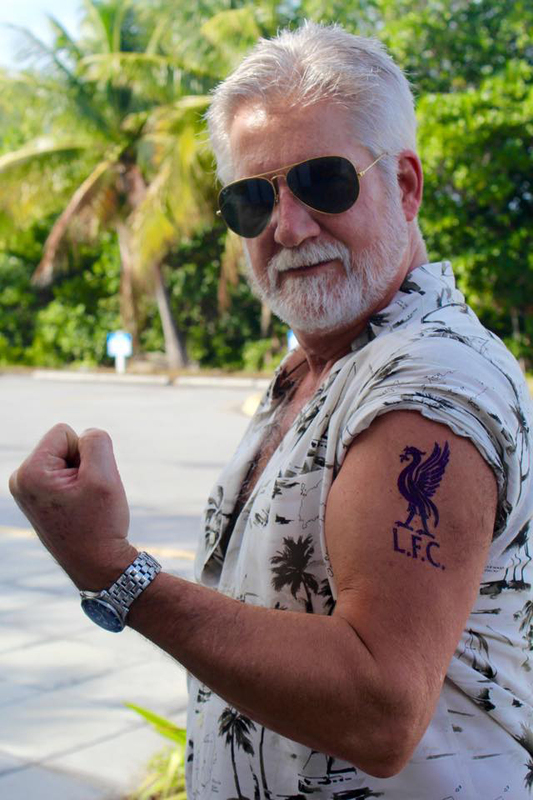 “Fearless” and that haunting, embedded anthem of Liverpool fans chanting “You’ll Never Walk Alone”, would live with me for years before sprouting into the miraculous master stroke that ended up clinching this long search process for a sports team I could believe in again, a football team from England by the name of Liverpool FC. Back to the selection process. With Everton, Liverpool and Tottenham all in the running, the details which made a difference to me between the clubs were surfacing: manager, owner, player age, player home country, and team history. The two teams from the city of Liverpool (Everton FC and Liverpool FC) had an interesting history, having once been one club team. 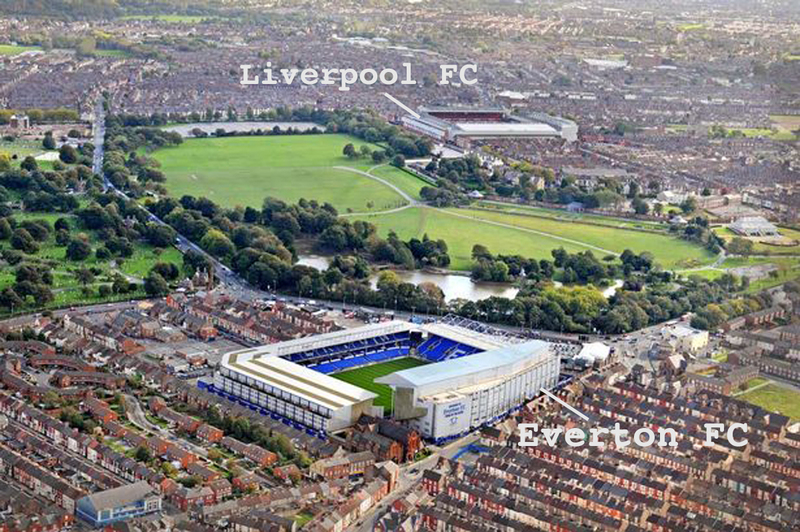 Everton FC split off from the Liverpool FC faction and left their original grounds at Anfield in 1892. They have had a gentlemanly rivalry between them ever since, called the Merseyside Derby (pronounced “Darby”) – after the River Mersey that runs though Liverpool to the sea. These two Premiere League games each year, home and away, are not much of a travel problem. 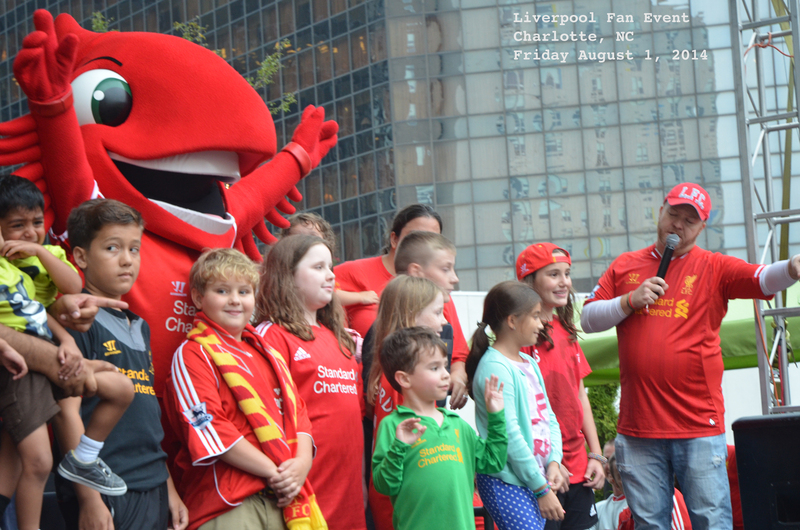 Their home stadiums are only separated by a quarter-mile distance, across Stanley Park in Liverpool, England. Liverpool is famous as a music city, the Nashville of England in rock and roll terms. The Beatles came from Liverpool, forever marking that place in music history. The story behind Liverpool FC’s famous anthem emerged in a surprising twist one day while I watched a game on television broadcast from their home field, Anfield. The stadium was alive with an electricity in the crowd, the television coverage hovered over a wild fan scene at one end of the stadium which the announcer called “The Kop”, one of the most famous home-fan seating areas in the world of soccer, located in the southwest end of the stadium behind the goal. 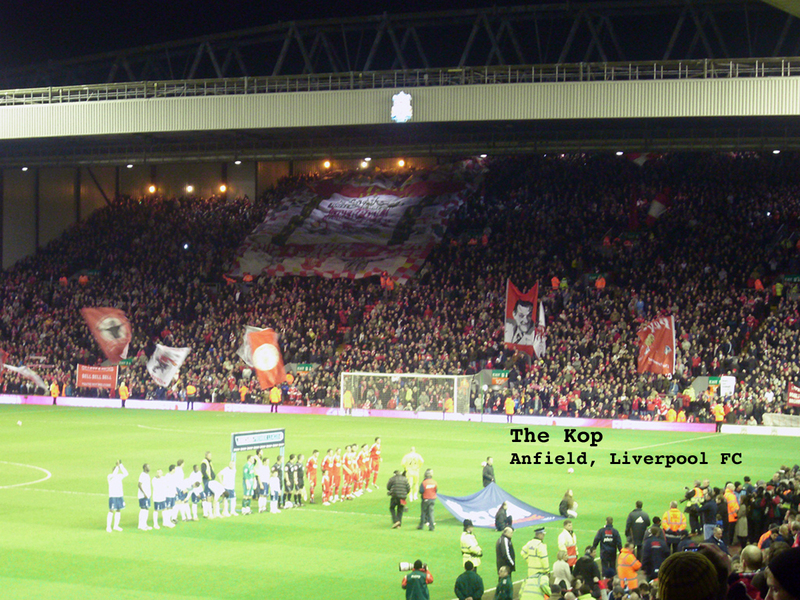 Anfield, Liverpool FC home ground, and the Kop in full voice and motion before a game. The camera’s microphone picked up a chant-song being raised by those wild fans in the Kop, and throughout the stadium. It sounded familiar to me sitting in my living room at Casa Donnybrook in El Paso. The announcer explained, as the cameras scanned the crowd standing and singing together, that this was the timeless anthem of Liverpool FC, “You’ll Never Walk Alone”. Whoa! I knew this song! Hauntingly familiar it was! That tune was seared in my memory, forever connected to my college years and those nights listening to Pink Floyd while drifting off to sleep. I jumped up and pulled out one of the drawers that hold my vinyl record collection in the entertainment center…reached for the Pink Floyd albums and grabbed “Meddle” from the stack. The cover was worn from years of handling. Sliding the vinyl out of it’s sleeve and onto my turntable, I put the stylus on track three of Side One…turning up the volume to match that of the televised game just getting started. There is was! That live recording of the chant-song intertwined into the studio recording by Pink Floyd, it was the same one as they were singing at Anfield on the television! So, it seems, the choice had been made for me many years before. 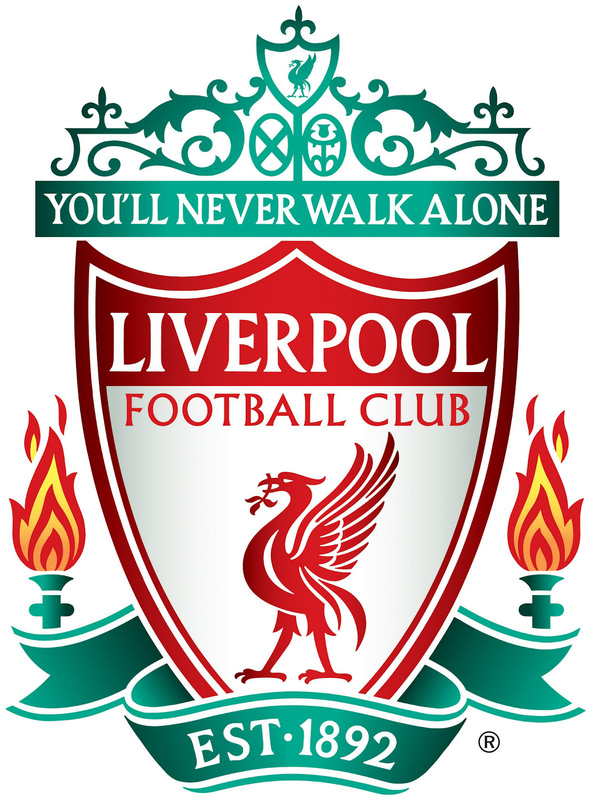 Liverpool FC had always been my team and I now understood how, through the forty or so intervening years, I could say with my whole heart that Liverpool FC were destined to save my passion for sports! I absorbed everything Liverpool FC that I could get my hands on. Finding out that Liverpool FC were now owned by a famous American sports entity, Fenway Sports Group-owners of the Boston Red Sox, only further reinforced my decision. 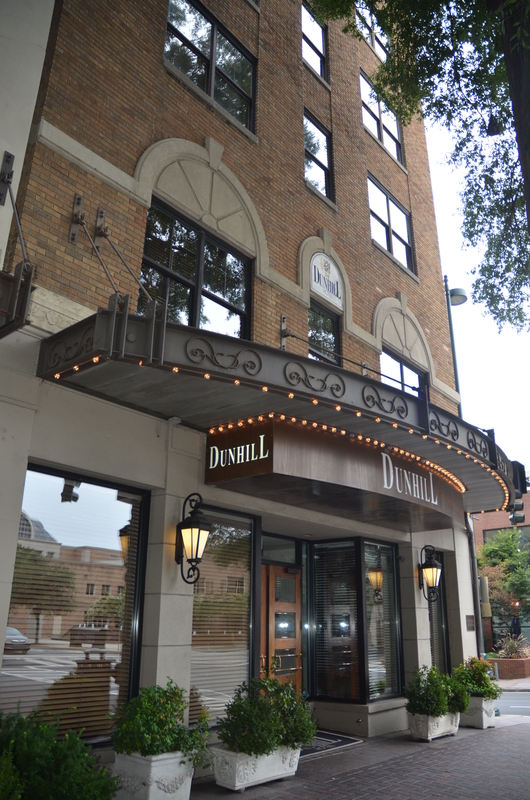 These owners were experienced and intelligent, operating with a humble and steady hand. They also knew intimately the process of re-building a once famous sports franchise into greatness. 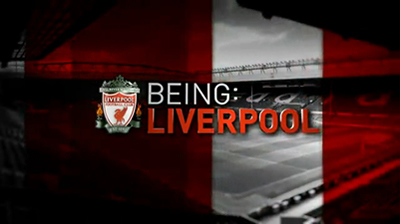 The American connection, team ethic and new coaching staff under Brendan Rogers was featured in the mini-series: “Being: Liverpool”, a 2012 fly-on-the-wall six episode documentary television series about Liverpool Football Club broadcast on Fox Soccer in the United States, Sportsnet in Canada, and Channel 5 in the United Kingdom. 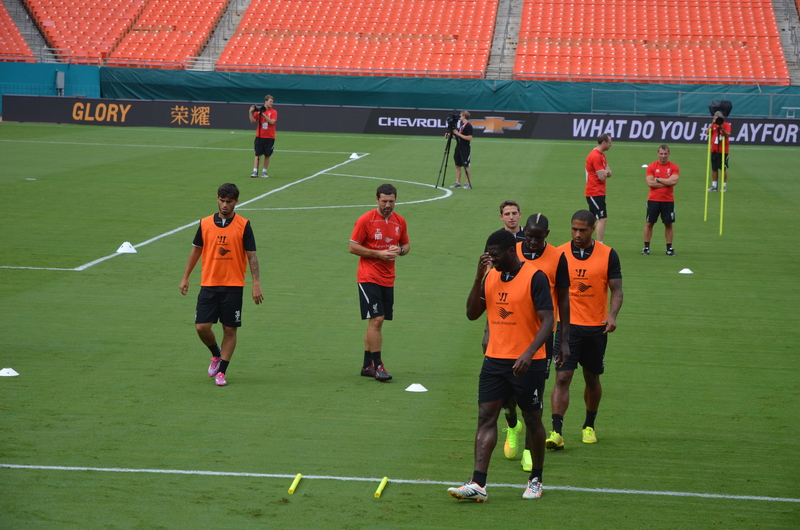 It followed the team behind the scenes on their pre-season in North America in July 2012 and the build up to their 2012–2013 season in the Premier League. I must have watched it five or six times. I was hooked. 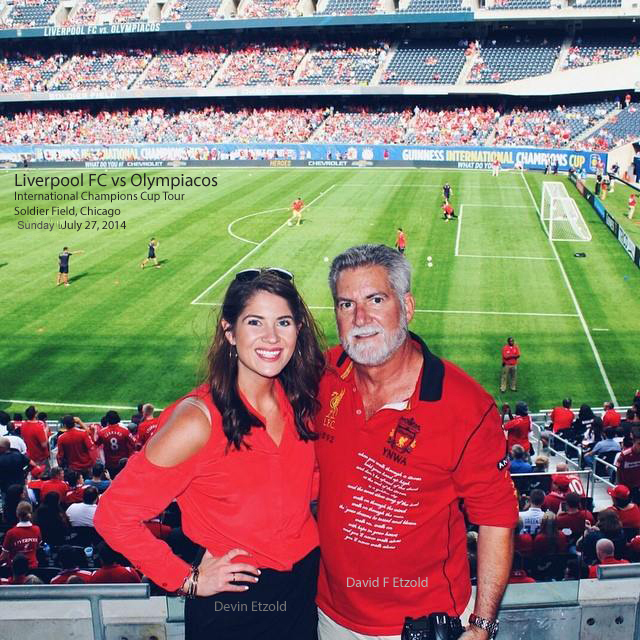 Chicago, Illinois at Soldier Field against Greek powerhouse Olympiacos on Sunday July 27th. 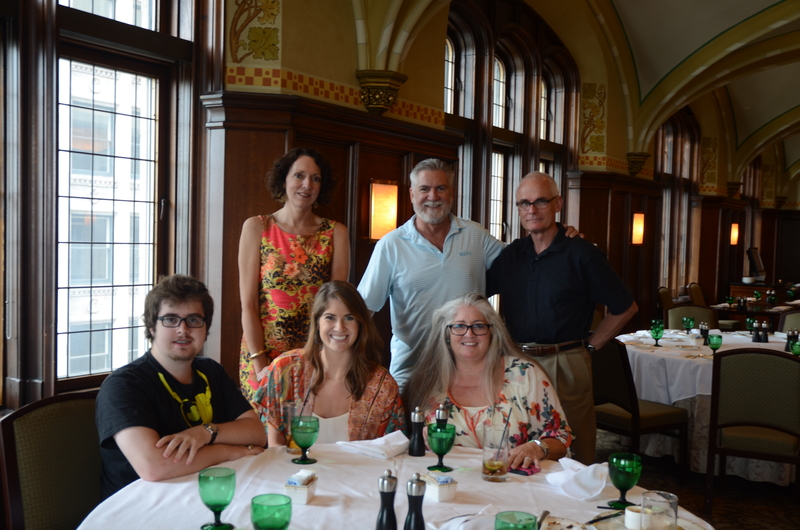 I flew to Chicago and met Melinda and two of my children, daughter Devin and son William. 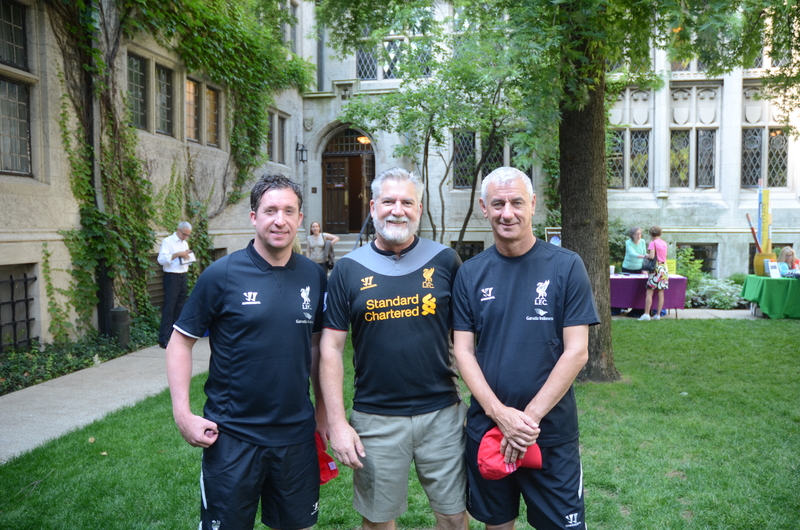 We spent the weekend enjoying Chicago and seeing our friends Chris and Lynn (Osmond) Multhauf, and I immersed myself in the excitement of my first live Liverpool game! 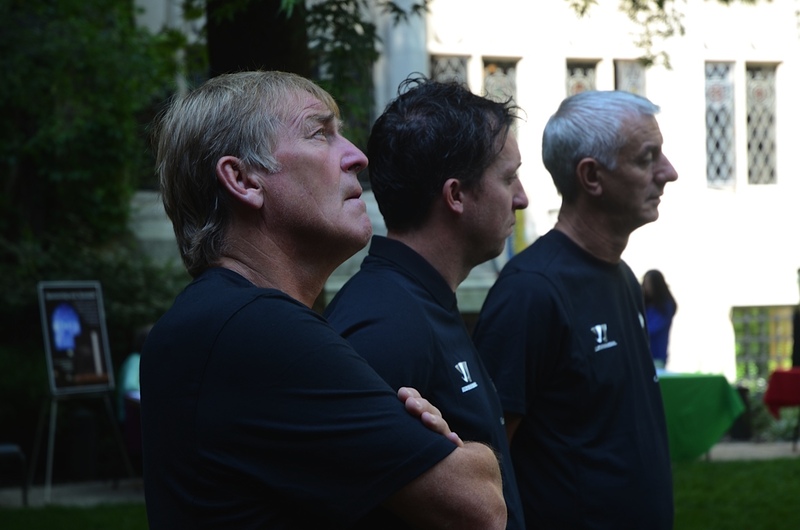 I even had the opportunity to meet Liverpool Legends Kenny Dalglish (former player and coach, known as “King Kenny”), Robbie Fowler and Ian Rush at a special presentation by the Chicago Architecture Foundation the day before the game, thanks to Lynn Osmond, president of the CAF. Liverpool won that game against Olympiacos 1-0, which was a beautiful cap to a wonderful first LFC experience. 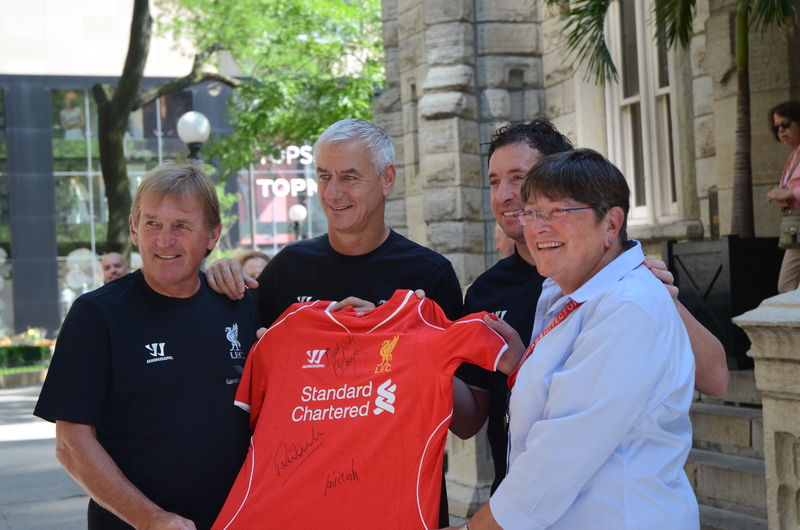 Chicago Architecture Foundation representative receives a signed team jersey from Kenny Dalglish, Ian Rush and Robbie Fowler in front of the Water Tower in Chicago, Summer 2014. 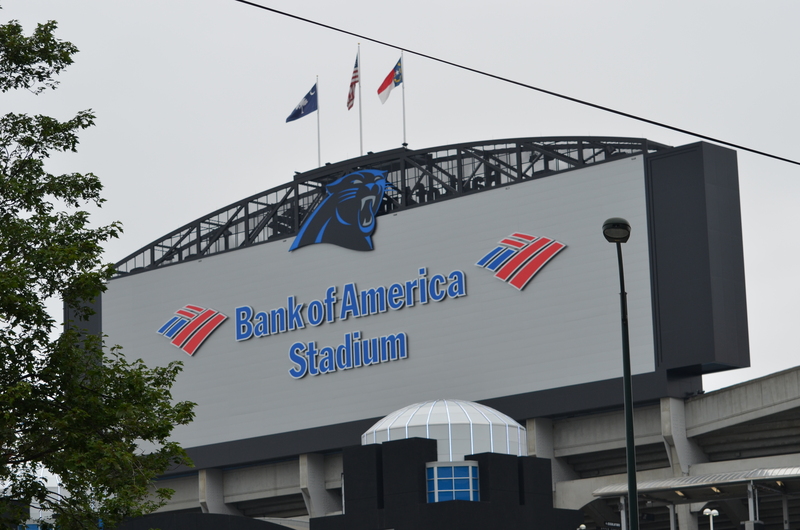 Charlotte, North Carolina the next weekend, at Bank of America Stadium on Saturday August 2nd against their old nemesis, AC Milan. 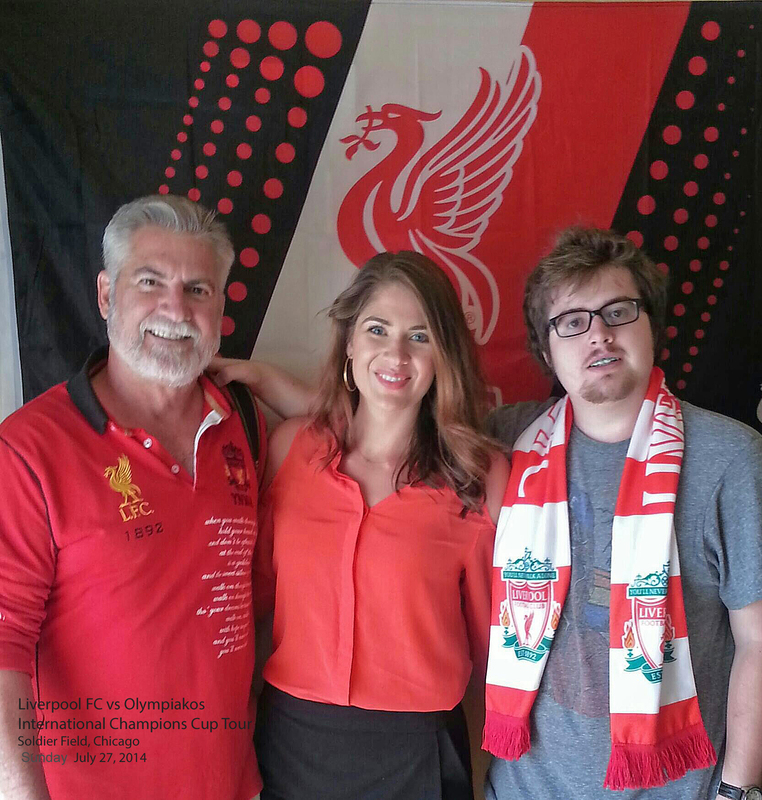 After suffering through moving to my new office back in El Paso in the middle of the week, I flew east to Charlotte, NC on Friday August 1st to meet my son-in-law Joseph Perry, who had discovered a new found sports affection for Liverpool FC, as well. 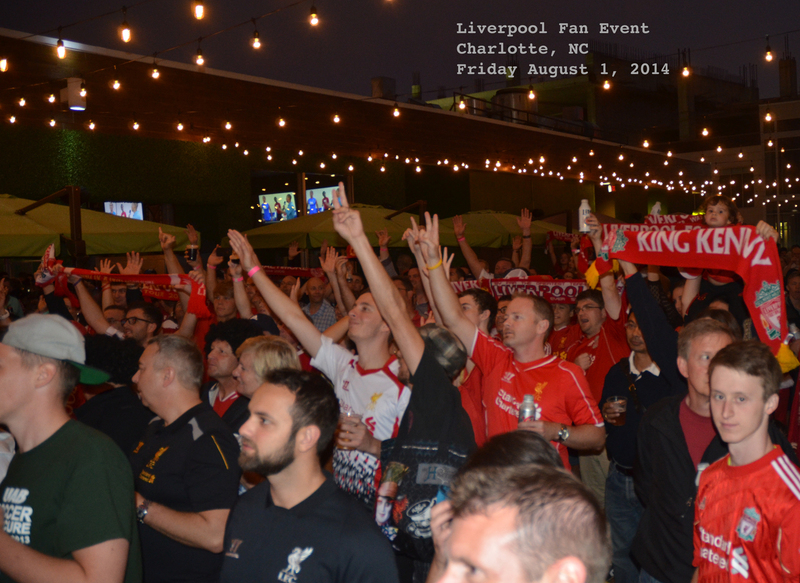 The City of Charlotte embraced Liverpool and it was fun to appreciate the lead-up events to the game. 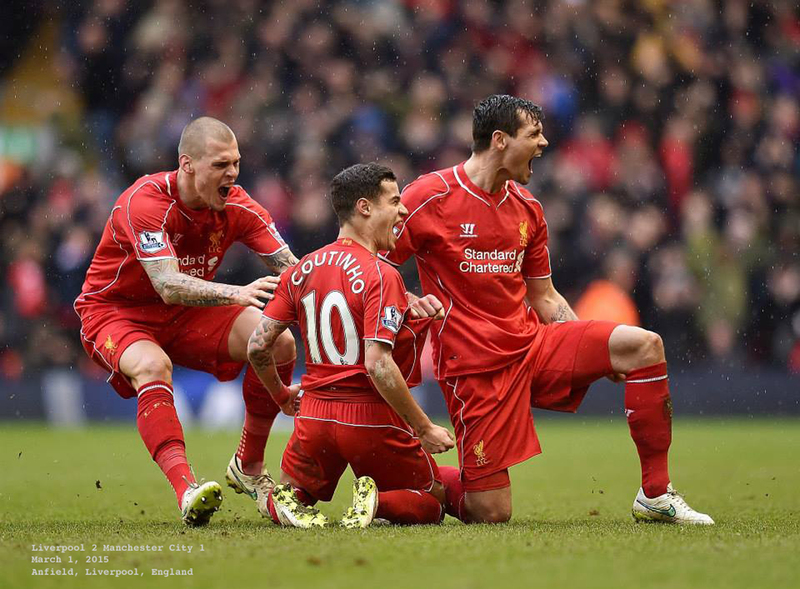 As if on cue Saturday evening, Liverpool won again, this time 0-2. 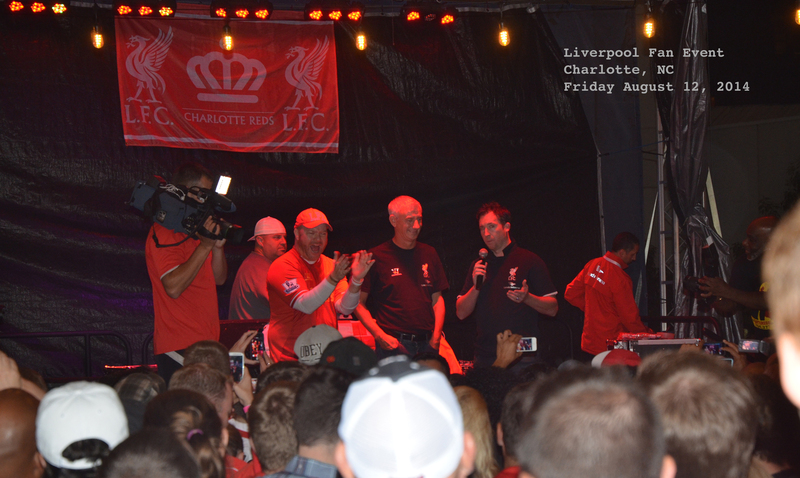 The party heats up as Liverpool Legends are introduced to the crowd in Charlotte! 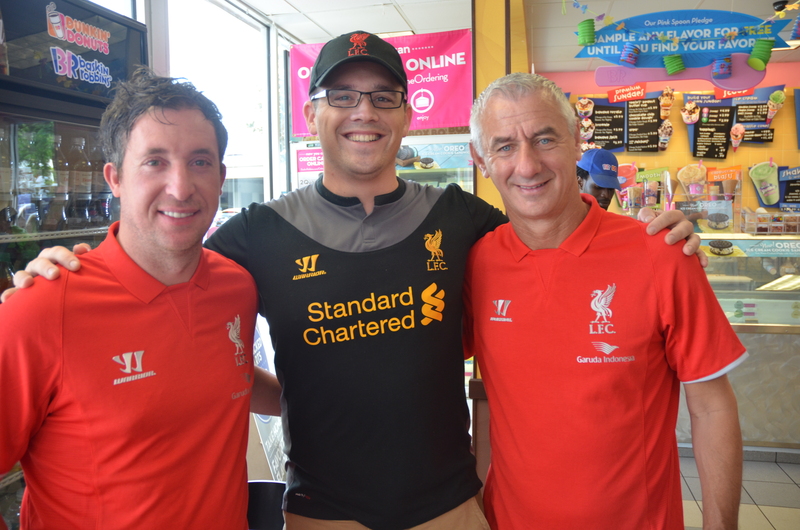 Huge welcome for Legends Ian Rush and Robbie Fowler! 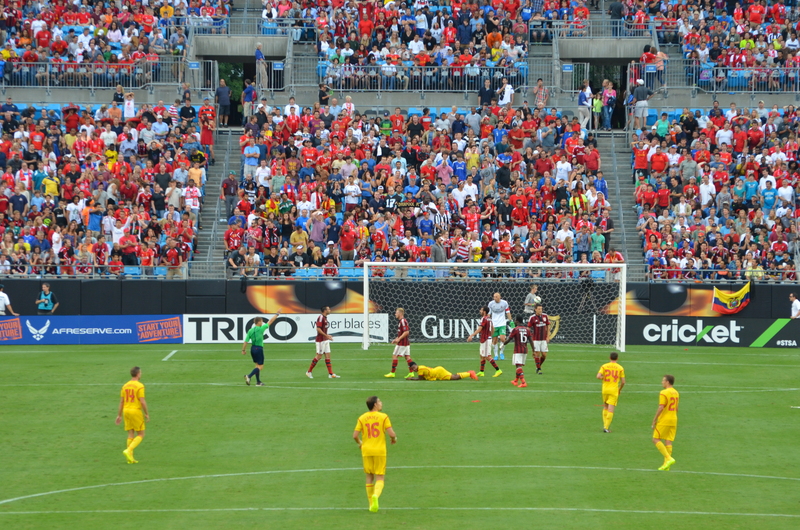 Joseph Perry (L) and David Etzold (R) with great seats for the Liverpool FC vs. AC Milan game! 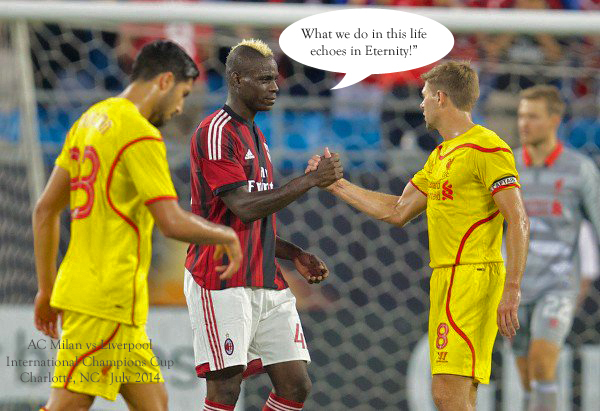 “Maximus Moment” on Bank of America Field in Charlotte: Gerrard greets Baloteli..soon to be teammates at Liverpool, with Emre Can in foreground! 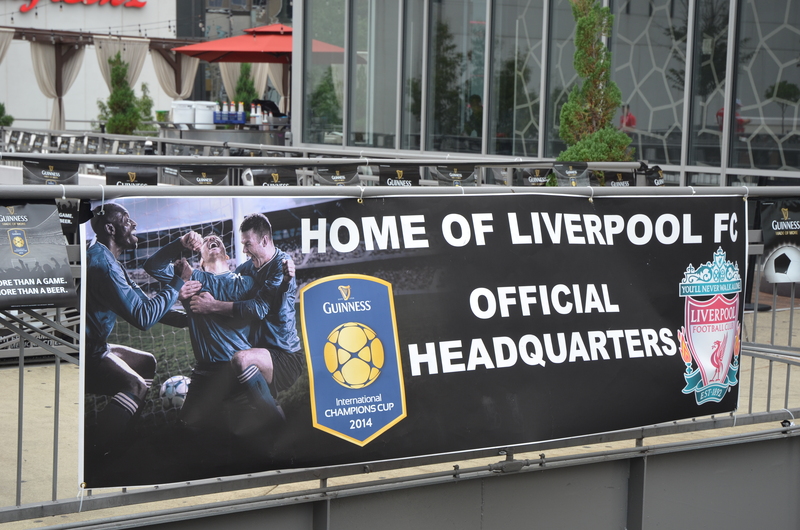 These two wins that I had witnessed in person, plus a draw against Manchester City played in New York City mid-week (when I was moving into my new office), qualified Liverpool for the 2014 Guinness International Champions Cup Final to be held at Sun Life Stadium on Monday, August 4th in Miami, Florida. Coincidentally, I had purchased two tickets to the finals when the tournament was first announced in February. It was to be played in Miami, only a few hours drive from my son-in-law and daughter who were living at the Naval Air Station in Key West, Florida, and I thought maybe we’d be visiting during the summer. 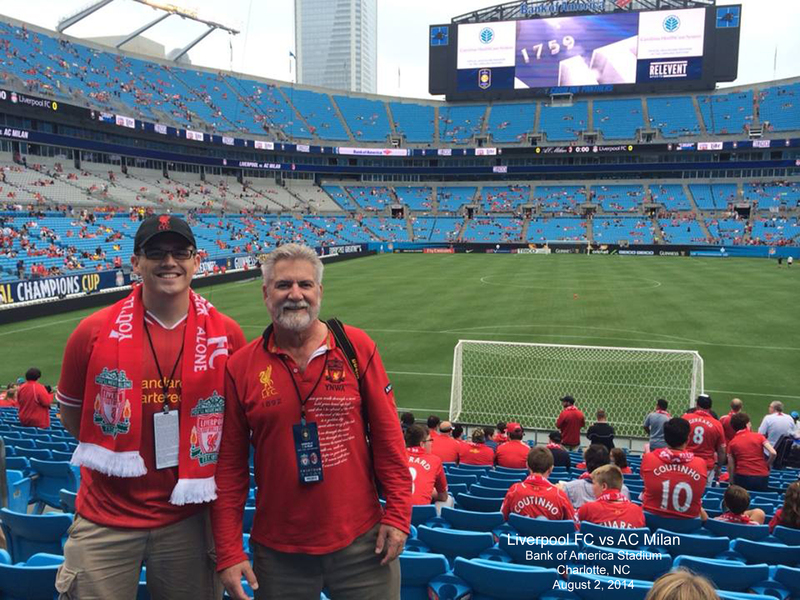 It was pure serendipity to have those tickets in hand in Charlotte and know that our team would be facing their arch-rivals Manchester United on American soil…and we would be witnesses! Joe and I flew from Charlotte to Fort Lauderdale International Airport to pick up Joe’s car on Sunday, the day after the win over AC Milan. 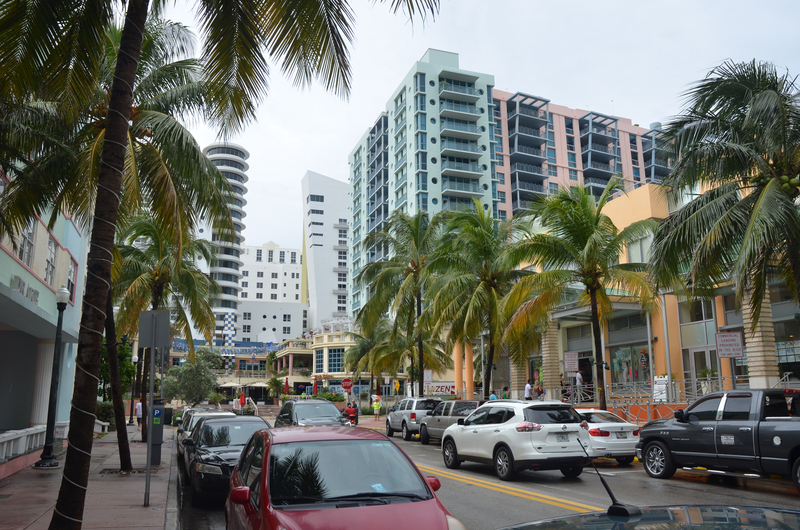 I had reserved a nice room at a convenient Holiday Inn on Miami Bay and we spent a great evening Sunday exploring Downtown Miami and South Beach together. 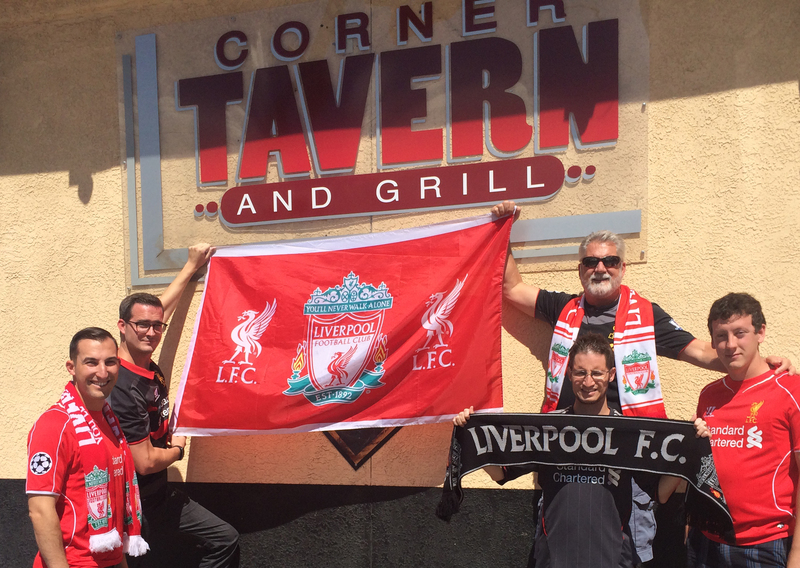 The game on Monday, drenched in constant waves of summer thunderstorms blowing through South Florida and overwhelmed with a huge crowd of Manchester United fans to put up with at Sun Life Stadium, proved to be a let-down: Liverpool lost 1-3. 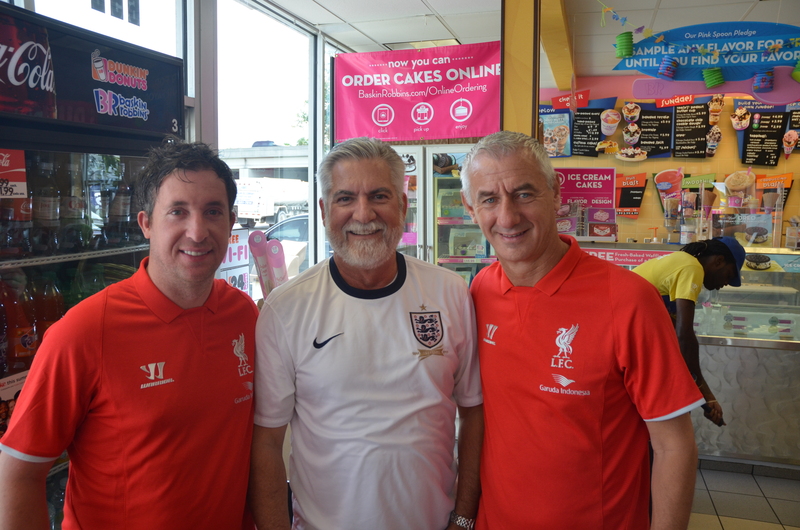 However, almost in consolation of that outcome, Joseph and I both got Liverpool FC sports shirts autographed at a meet and greet event with Robbie Fowler and Ian Rush at a Dunkin Donut shop on the morning of the final match. Today I have one of the finest examples of framed, autographed Liverpool FC memorabilia hanging in my Great Room, above my pool table in a place of honor. 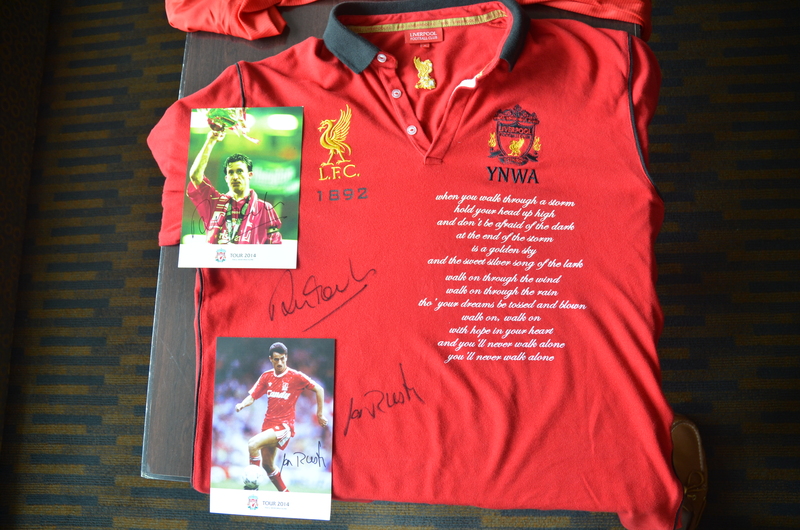 Robbie Fowler and Ian Rush signed both my shirt and each of their hand-out photos. That shirt now serves as a permanent memory of an incredible Summer soccer adventure! This is why I can now say that my passion for sport was saved by Liverpool FC, and why this Border Gringo will forever know what it means to be a courtier in King Kenny’s Court! Kenny Dalglish, King Kenny of Anfield Fame, welcomed me to my new sports kingdom. My excitement and passion for sport is back. Y N W A…. Heroes are hard to find, cherish them when you do! ~ by Dave Etzold on February 28, 2015. Thank you David for a great ride in your chase to replace football with soccer. How fortunate to have made all the trips to connect with the right team. Love the connection with Pink Floyd. Happy to see your smiling face again. Best regards for health and happiness. Margie Velez, former Regional Director for Senator Phil Gramm.